After a year of preparations by the organization committee, a group of 11 international amateur radio operators aired JW0PK from one of Europe’s most wanted islands of the IOTA program, Prins Karls Forland. This story is intended to give you an impression of how we got there, how we spend our time on the island and how we got back safe again. For the operation that should count for “Spitsbergen’s Coastal Islands” EU063, a location was chosen on the East coast of Prins Karls Forland island, the most western island of Svalbard. 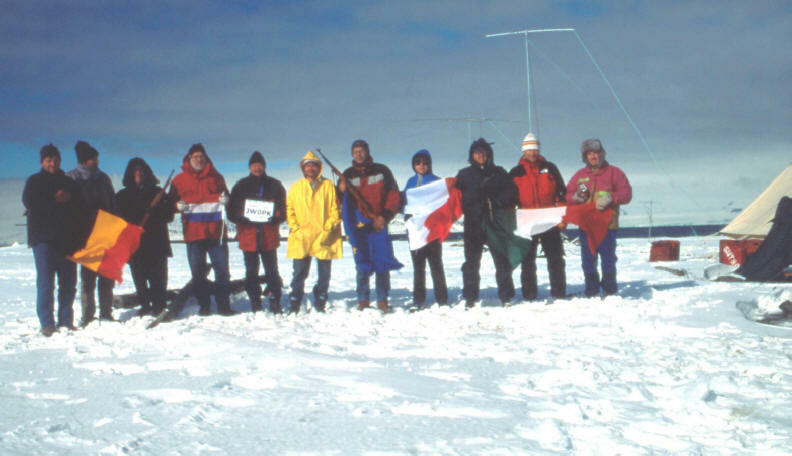 The exact location to be 78° 26’ 39”N and 11° 53’ 37” E. To mount a DXpedition to that area was quite a challenge. Apart from arranging operators, logistics, sponsors, etc. also special permits needed to be arranged from the Governor of Svalbard. The detailed map of Poolepynten shows the tip of the peninsula on Prins karls Forland. During our stay the whole area was covered with a thick layer of ice and snow as can be seen on the picture. Only at our camp we were able to see some soil which looked as if we were camping on a small coral reef and surrounded by a white sea. On the top picture you can see the mountains in the distance which are located on the main island of Spitsbergen. The following information was collected from the IOTA web site (www.rsgbiota.org) in 200. The listings are provided for the benefit of intending DXpeditioners. They list the most wanted IOTA Groups for each continent (In this case Europe) and show for each group the proportion of members who have submitted valid cards. Note that “rare” groups, defined as those which less than 10% of members have credited, have been marked with “*”. For an operation from any of these groups, validation data is required and will need to be sent to the IOTA Committee as soon as possible (Refer to Section F. 3 of the Rules). The information here reflects the position as of 28-04-2001. It will change as cards are received and submitted for credit. At any time there will be operations that have just taken place, for which cards will not yet be in circulation. This explains the reason why some groups are shown as having been worked by no members or by far fewer members than expected – given the scale of the activity. Svalbard is a group of islands located between 71-81°N and 10-35°E and covers an area of about 63.000 sq km of which approximately 60% is covered with glaciers. The largest islands are Spitzbergen, Nordostlandet, Barentsøya, Edgeøya and Prins Karls Forland. Longyearbyen is the administrative center and has approximately 1400 inhabitants. Barentsburg is a Russian mining community and is housing 850 inhabitants. The other mining community is Sveagruva with 90 commuters. The Norwegian international research center is at Ny-Alesund with 40-100 researcher and support staff (depending on the season) and a Polish research station is at Hornsund with only 8 inhabitants. The Forlandet National Park is the smallest of the three national parks. The landscape of this long, narrow island varies from low-lying shores to high peaks, with a number of small glaciers. There are important breeding sites of eider ducks and geese. The island lies in the path of the northernmost branch of the Gulf Stream, and as a result of the relatively mild climate the island is home both to one of the world’s most northerly breeding colonies of guillemot and to the northernmost population of common seal. It has an area of 640 km2 and protected since 1973. The international team was made up by operators representing various European countries. We had one operator from Norway, two from Poland, four from Italy, one from Belgium, one from France, one from Germany and one from the Netherlands. The first leg of the trip was to Oslo where I met up IK2XDF. Next we flew from Oslo to Longyearbyen where arrived on May 31 around midnight and directly met with the initial group of LA3OHA, SP5DRH, SP5LCC, I2ADN, IK2XDE and IK4MED. The team had already loaded the M/S Farm, which was chartered for this DXpedition, with all equipment and supplies. As soon as IK2XDF and PA5NT met the team, they went to the harbor to load the last pieces of equipment and left Longyearbyen at 01:15 hrs on June 1st, with Prins Karls Forland ahead. LA3OHA stayed in Longyearbyen to collect the other people for the second group. The spirit was good and we were talking and thinking about what was going to happen the next 9 days. After a 7 hours long journey with the M/S Farm on a rough sea, we arrived at 08:00 hrs at the Poolepynten on Prins Karls Forland island. The Farm anchored about 100 meters off shore and the first landing with the zodiac was at 08:20 hrs. SP5DRH and IK2XDE were the first to go ashore. All equipment and people were brought ashore in 5 trips with the zodiac and this was completed at 10:00 hrs. At this point the M/S Farm returned to Longyearbyen to collect the second group and we were left alone on a cold and windy island covered with snow and with a pile of cargo. Lots of work to do and ready to start the real DXpedition work. Two pistols and two rifles were brought to protect us in case a polar bear would show up and trying to come too close to our camp. The cargo included the big tents (not the small sleeping tents), heaters, generators, half of the fuel, food, water, equipment, masts, antenna’s and a lot more. After all the equipment was at the beach, we had to carry everything to the area where we had to establish the camp. First we erected the lavvu tent (traditional cone shaped Norwegian tent) because this should serve as our general purpose shelter. Next we erected two tents for the radio stations. By the time this was done, it was approximately 14:30 hrs and we started to have our first coffee and bread. Next the beds were organized in the lavvu tent and others unpacked the generators and filled them with oil and fuel after which we had electric power available. One strange experience was that we did not need lamps in our tents as we had light 24 hours a day. After the tents were ready, some started to distribute all food, equipment, personal belongings, etc. to the respective tents while others assembled and erected the antennas. At 18:00 hrs the Force 12 – C3S antenna was ready and around 19:00 hrs the 6 meter and ECO Asay tri-bander were also ready and operations could start. The next day, June 2nd, we noticed the M/S Farm at the horizon around 07:40 hrs and at 08:15 the M/S Farm anchored in front of the camp and offloaded and transported the rest of the equipment to the camp. Along with the equipment, the remaining team members LA3OHA, DL5NAM, ON4AMX and F5PBL arrived at the camp to complete the team. All tents and mast were place on the small sandy strip, the only area that allowed us to fix the anchors and pins for the tents and masts. The two HF aerials were placed on two 8 meter high masts and the 6 meter antenna was on a 12 meters mast. Five radio station were in use, one for 6 meters, one for satellite and three for HF. Power was generated by 4 generators, each of them approximately 1 kW and running on petrol. We brought 15 jerry cans with petrol, which is about 300 liters. At the two main HF stations and the six meters station, the 12 VDC output of the power supplies was buffered by 200 Ah batteries. ON4AMX dipole for 17 meters. All stations were using CT logging software. We had three white tents that would be used as radio stations but quickly we decided to establish our radio’s in only two tents. The sleeping tents were scattered around the lavvu tent. The shape of the camp was more or less created by the landscape itself. We needed to have some sand foundation for the tents and masts and there was just enough to do so. The orange beacon and the Governor’s hut (with chimney) can be seen in the background on some pictures. The Governor’s hut was locked and not available for our stay. Just in case of emergency we could eventually force our way in. Most of the time we were running two HF stations at the same time. Due to the limited available area for the camp, the antennas were rather close to each other and consequently causing the necessary interference. Some planning and power reduction were sometimes necessary. To enable us working simultaneous stations, Marc ON4AMX constructed a simple 17 m dipole. It could only be hung a few meters above the ground but it turned out to be working great and soon it was called the ON4AMX special! Now a third HF station could be active whenever propagation allowed so and interference with the other two stations was acceptable (depending on band and mode). Due to the exceptional geographical location with constant daylight, we were unable to make contacts on 160, 80 and 10 meters. Chris DL5NAM operated RTTY and PSK31 and managed to work a total of 427 contacts. Chris also facilitated us to send e-mail from our very remote location. Operating from JW was a nice experience for all of us, as it is quite different from working at home. Working State side, Europe and Japan all at the same time was great. On the other hand we were sometimes surprised when calling CQ and getting only so now and then a reply from JA’s or W’s although they had very strong signals. Although mountains were stretching along the West side (direction North and South America) of our camp, we made a reasonable number of contacts into North and South America. The six meter station could operate whenever we had propagation. Angelo I2ADN our 6 meter guru was very eager to use every minute of each opening and he managed to log 178 contacts. Our satellite operation was very limited and reached its highlight just at the end of our stay. To prepare for departure of the first group, we dismantled the operating tent that was housing HF-station 1, 6 meters and satellite. Because of the extremely nice weather conditions, Dario IK4MED placed his gear on a table outside the tent for a last attempt. Andrea IK2XDE was asked to act as rotator and keep the antennas pointed to the satellite, on instruction of Dario. It was a real excitement to hear stations coming in very strong. Dario managed to make 10 contacts although this could had been more if more station would have called. Bill N9JWO was very load and made a second QSO because no one else answered our call. At the left, Dario at the radio, Andrea pointing the antennas to the satellite and Giampaolo IK2XDF making a movie of the event. It should be noted that the conditions under which the operators were working, were rather difficult. The temperature was the biggest enemy and operations were sometimes cancelled because it was simply too cold to stay in the tent. This was certainly the case during night hours for the Italian operators who were operating SSB from the same tent which was not heated. On Wednesday and Thursday (June 6 and 7) there was no wind and the whole day sunshine, which made life very pleasant and it was warm inside the tents. For general use we had a lavvu tent where we prepared the food, had dinner and we could stay for a while to get warm again. Operations was done from two white rectangle shaped tents of which only one was warmed up by a paraffin heater (one heater turned out to be defective). For sleeping we used small 2 person dome shaped tents. So now and then some people made use of the lavvu tent for sleeping, on the beds that were placed there for sleeping or sitting. Although a bit more noisy, sleeping in the lawu tent was a lot more warmer! Although Terje did most of the cooking, other members assisted him. The Italians offered to make their famous pastas and Marc is now known for his bacon and eggs. As the days went by, there was less choice in food and gradually Terje started to be creative in preparing variations of his famous survival soup, which can be anything that is put together in a big pot and cooked for a few hours on the stove, after which it was called to be ready (see picture). Cleaning our pans, plates and cutlery with snow and cold water was always a hassle. Washing yourself was kept to the minimum necessary. As long as all people were doing this there is no problem. However, if someone should wash himself, it would quickly be noticed by the others who would feel guilty for not washing. That could not be tolerated and we decided that the first who starts washing himself would be punished and exiled to the most remote tent of the camp. Going to the toilet (at the beach or other arrangements) was also an unpleasant exercise. During this necessary action, you also had to be careful that you were not be seen by a polar bear and it was avisable to carry an alarm gun for protection. Other activities included filling the generators, filling the stoves with paraffin (200 liters was brought to the island), cleaning the tents, adjusting the tents and anchor pins, reinforcing the tents in case of heavy winds, bear watching, etc. For the rest there was time for rest, socializing, field trips, etc. The area of Svalbard is also known for the polar bears and measures had to be taken to avoid an unpleasant encounter with this giant creature. We had two alarm pistols that could fire or flares. This should be used in the first place to scare the polar bear and hope it would run away. In the case this would not have effect, we had two rifles that could be used to shoot into the ground just in front of the bear to scare him and if that wouldn’t help either, we should eventually kill the bear. Fortunately, the latter situation did not happen. To avoid a sudden encounter with a polar bear, we established a bear-watching schedule. This was a very cold exercise and often interrupted by a visit to the lavvu or operating tent to warm yourself up. The area of Svalbard is also known for the polar bears and measures had to be taken to avoid an unpleasant encounter with this giant creature. We had two alarm pistols that could fire or flares. This should be used in the first place to scare the polar bear and hope it would run away. In the case this would not have effect, we had two rifles that could be used to shoot into the ground just in front of the bear to scare him and if that wouldn’t help either, we should eventually kill the bear. Fortunately, the latter situation did not happen. To avoid a sudden encounter with a polar bear, we established a bear-watching schedule. This was a very cold exercise and often interrupted by a visit to the lavvu or operating tent to warm yourself up. One day, Chris DL5NAM spotted a polar bear on the beach and alarmed us. With great excitement, we grabbed the pistols and rifle and went outside. No bear could be seen but we were very careful, as the beach was not visible from our position. We fired first two rounds with the pistol followed by two round with the rifle. We than inspected the beach but no bear could be seen anymore, except some footprints. Later that day however we recognized footprints of the bear around the tent that was not in use for operations but also around the tent I had been sleeping a short while ago. This proofed that a bear watching schedule is absolutely necessary for your own safety. Although known from book readings and experience by some of the team members, it was for the other members very exciting to witness the rapid changes in weather conditions. This is typical for Arctic regions and requires careful planning and preparations for outdoor work and field trips. During our stay we have experienced all possible conditions, from snow and heavy winds till very beautiful and quite sunny days. Temperature is not just the only factor that makes you feel cold. The wind will multiply that by a factor 2 to 4. The pictures shows the different weather conditions we experienced. The return trip of the team was planned to be over two days with one group going on Friday June 8 with part of the equipment and materials. Finally the rest of the team and the remaining equipment and materials should go back to Longyearbyen on June 9. Terje had arranged that the M/S Farm should leave Longyearbyen on Friday at 00:00 hrs and was expected to arrive at Poolepynten around 07:00 hrs. On Wednesday and Thursday we had extremely nice weather condition with blue sky, the sun heating everything up and a very calm sea that looked like a mirror. We ensured each other that we could expect a pleasant departure from the island under these conditions. However, the Arctic showed its real habits and around Thursday midnight, the weather changed rapidly and we ended up in extremely bad weather conditions with strong Southern winds, snow and very high waves. You do not need to be an expert to understand that this would create a serious problem for our departure. We were expected to see to chartered boat around 06:00 hrs at the horizon but this did not happen. Most of the team was sitting and waiting in the lavvu tent. With the existing bad weather, no clue about transport, no extensive food supply, one starts to think what’s going to happen next and how long it may take before a ship is going to collect us. To prepare for the worst, Gerben PA5NT was elected to be eaten first. Around 12:00 we were a bit concerned about the transport and decided to contact a Scandinavian amateur to make a phone call to Longyearbyen. We got in contact with the club station SK3LH and asked the operator to contact Longyearbyen to collect information about our boat. However, JW5DW asked SK3LH to relay a message because he could not contact us directly. Our chartered boat had engine problems and was unable to collect us. Instead the skipper arranged for another vessel to pick us up at 20:00 hrs the same day. That was excellent news. At 16:00 hrs we started to dismantle the camp which resulted in people running around, teamwork, pieces of equipment scattered around but finally resulting in a pile of cargo on the beach waiting for transport, We did not dismantle the lavvu so we could use it for necessary shelter. It was hard work in heavy wind, snow and low temperatures. At 19:00 hrs, the vessel could be seen on the horizon, so we could finally dismantle also the lavvu tent because we were sure to be leaving the island within a few hours. Somewhat later we contacted the vessel by VHF and discussed the landing area. It was decided to choose an area on the leeward side of our camp and started to carry all materials to the new landing place. This was extremely hard work and we all were exhausted. At 19:45 hrs the vessel anchored on the leeward side of the peninsula and set out an aluminum zodiac to collect materials and persons from the beach. This was still a risky operation due to the waves that were hitting the boat. It took 5 journeys (see picture on the left) with the zodiac to get everything aboard the vessel. The crew of the vessel helped us to stow all cargo in special storage areas. It was around 21:30 hrs that we lifted anchor and started our journey back to Longyearbyen. Once safe on the vessel and being sure to return back home, references were made to the quotes of previous expeditions: “We made it”. We then experienced the nice and warm environment of a perfect tourist vessel (The Isbjørn II is normally used for tourist cruises in the Svalbard waters). Most of us went to lay down on a nice bed in a warm hut and tried to sleep. It took us about 8 hours to reach Longyearbyen. During this trip we clearly understood why the crew did so much work to secure our cargo on deck. Waves were high and the vessel moved by the sea as if it was a small dingy. At 05:30 hrs (June 9) we arrived at the harbor of Longyearbyen. The Italian team was just in time to pay a brief visit to the motel after which they left for the airport to catch the plane to Italy. The rest of the team offloaded the vessel and transported all the equipment to a storage facility at Longyearbyen. Finally we went to the motel for check-in and to take a long awaited hot shower, a fantastic breakfast and some rest. Marc and Gerben used their time to fix the famous ON4AMX dipole between the buildings of the motel and made some brief operations JW/. By Monday, all members had left Svalbard and returned safely at home. Being back home, it is nice to experience the luxury of facilities such as running water, toilet, shower, etc. and enjoy the pleasant temperatures but none of the team would have missed this fantastic experience in the Arctic. This is also confirmed by the fact that discussions are continuing about the next DXpedition in the Arctic region.